Автор(ы): Gray D.J., Lintern M.J., Longman G.D.
Издание: Journal of Geochemical Exploration, 1998 г., 17 стр. Автор(ы): Filho S.R., Maddock J.E.L. 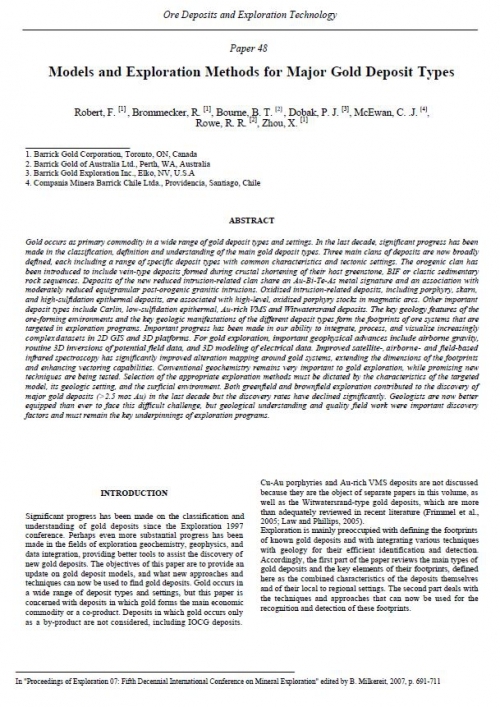 Издание: Journal of Geochemical Exploration, 1997 г., 10 стр. Gold has been exploited intensively in the Brazilian Amazon during the past fifteen years using garimpo methods (small-scale gold mining). 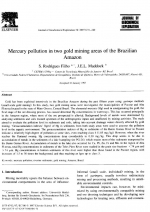 In this study, two gold mining areas were investigated, the municipalities of Pocone and Alta Floresta located in the state of Mato Grosso, Central Brazil. 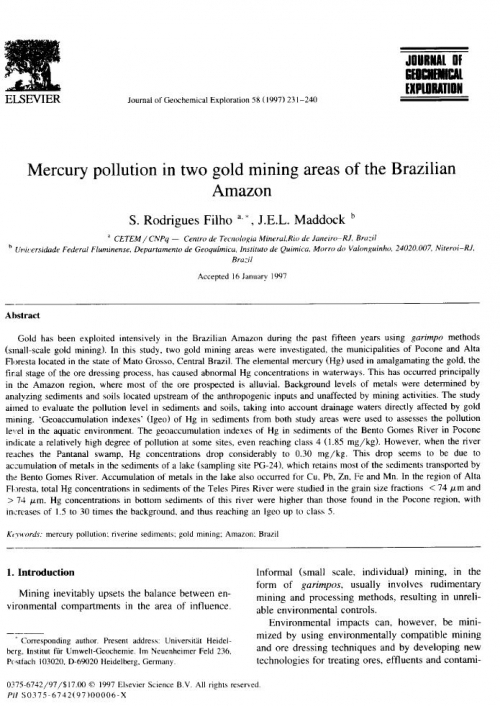 The elemental mercury (Hg) used in amalgamating the gold, the fir.al stage of the ore dressing process, has caused abnormal Hg concentrations in waterways. This has occurred principally in the Amazon region, where most of the ore prospected is alluvial. Background levels of metals were determined by analyzing sediments and soils located upstream of the anthropogenic inputs and unaffected by mining activities. The study aimed to evaluate the pollution level in sediments and soils, taking into account drainage waters directly affected by gold mining. 'Geoaccumulation indexes' (Igeo) of Hg in sediments from both study areas were used to assesses the pollution level in the aquatic environment. The geoaccumulation indexes of Hg in sediments of the Bento Gomes River in Pocone indicate a relatively high degree of pollution at some sites, even reaching class 4 (1.85 mg/kg). However, when the river reaches the Pantanal swamp, Hg concentrations drop considerably to 0.30 mg/kg. This drop seems to be due to accumulation of metals in the sediments of a lake (sampling site PG-24), which retains most of the sediments transported by the Bento Gomes River. Accumulation of metals in the lake also occurred for Cu, Pb, Zn, Fe and Mn. In the region of Alta Floresta, total Hg concentrations in sediments of the Teles Pires River were studied in the grain size fractions < 74 /urn and > 74 /xm. Hg concentrations in bottom sediments of this river were higher than those found in the Pocone region, with increases of 1.5 to 30 times the background, and thus reaching an Igeo up to class 5. Автор(ы): Fletcher W.K., Hou Z.
Издание: Journal of Geochemical Exploration, 1996 г., 10 стр. Harris Creek is a Au-rich, cobble-gravel bed stream in southern British Columbia, Canada. A preliminary study, based on analysis of < 0.053 mm sediments and heavy mineral concentrates (SG > 3.2) from bulk sediment samples, identified accumulations of Au at breaks-in-slope of the stream gradient. This is consistent with theoretical models of heavy mineral transport by streams (Day and Fletcher, 1991). However, the breaks-in-slope also coincide with active landslides that might, because of the form of the Au anomalies, be interpreted as the source of the Au. To investigate this we have: (1) monitored erosion of the landslides and determined their Au content; and (2) used multi-element geochemistry (with Al, Mg, Na, Ba, Ti, P and Sr) to fingerprint the influence of one of the landslides on the composition of the < 0.053 mm fraction of the stream sediments. 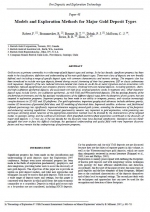 Автор(ы): Leake M.J., McCaughey S.N., Parris B.W., White N.C.
Издание: Journal of Geochemical Exploration, 1995 г., 50 стр. 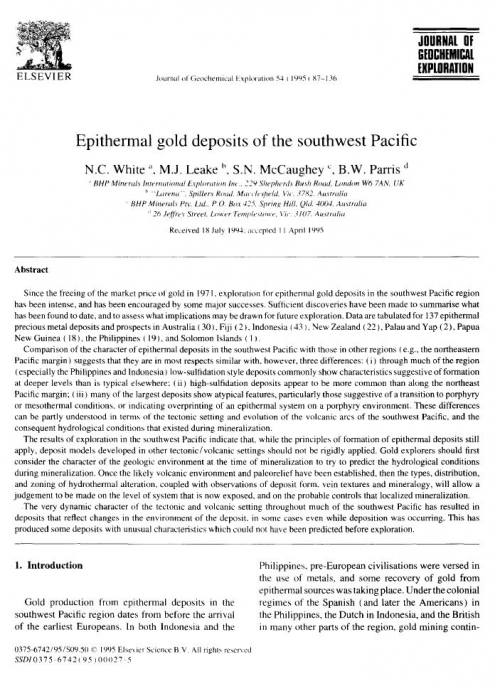 Since the freeing of the market price of gold in 1971. exploration for epithermal gold deposits in the southwest Pacific region has been intense, and has been encouraged by some major successes. Sufficient discoveries have been made to summarise what has been found to date, and to assess what implications may be drawn for future exploration. Data are tabulated for 137 epithermal precious metal deposits and prospects in Australia (30), Fiji (2). Indonesia (43 ). New Zealand (22), Palau and Yap (2), Papua New Guinea (18), the Philippines (19), and Solomon Islands (1). 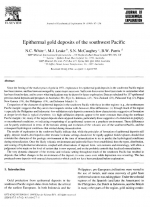 Comparison of the character of epithermal deposits in the southwest Pacific with those in other regions (e.g., the northeastern Pacific margin) suggests that they are in most respects similar with, however, three differences: (i) through much of the region (especially the Philippines and Indonesia) low-sulfidation style deposits commonly show characteristics suggestive of formation at deeper levels than is typical elsewhere; (ii) high-sulfidation deposits appear to be more common than along the northeast Pacific margin; (iii) many of the largest deposits show atypical features, particularly those suggestive of a transition to porphyry or mesothermal conditions, or indicating overprinting of an epithermal system on a porphyry environment. These differences can be partly understood in terms of the tectonic setting and evolution of the volcanic arcs of the southwest Pacific, and the consequent hydrological conditions that existed during mineralization. The results of exploration in the southwest Pacific indicate that, while the principles of formation of epithermal deposits still apply, deposit models developed in other tectonic/volcanic settings should not be rigidly applied. 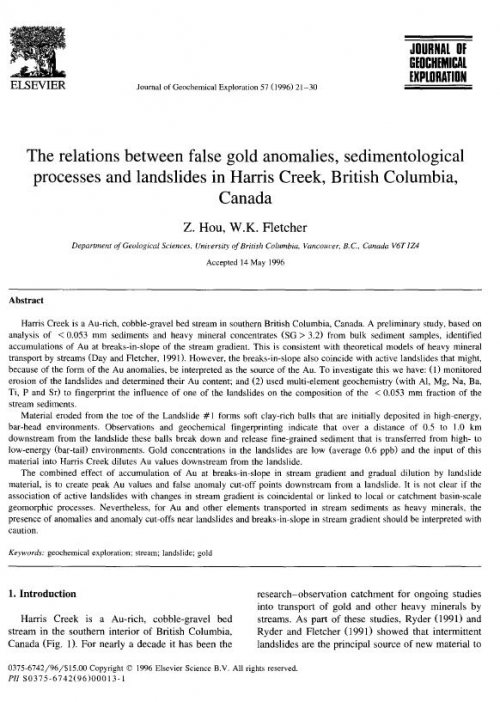 Gold explorers should first consider the character of the geologic environment at the time of mineralization to try to predict the hydrological conditions during mineralization. Once the likely volcanic environment and paleorelief have been established, then the types, distribution, and zoning of hydrothermal alteration, coupled with observations of deposit form, vein textures and mineralogy, will allow a judgement to be made on the level of system that is now exposed, and on the probable controls that localized mineralization. The very dynamic character of the tectonic and volcanic setting throughout much of the southwest Pacific has resulted in deposits that reflect changes in the environment of the deposit, in some cases even while deposition was occurring. This has produced some deposits with unusual characteristics which could not have been predicted before exploration. Издание: Geological Fieldwork, 1998 г., 14 стр. 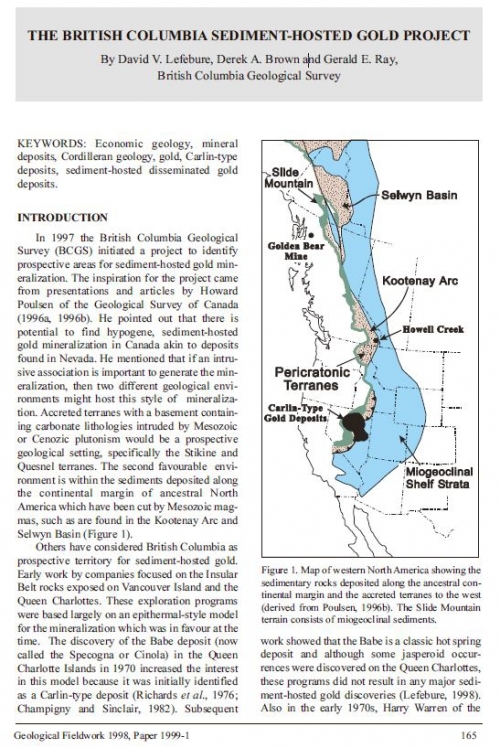 In 1997 the British Columbia Geological Survey (BCGS) initiated a project to identify prospective areas for sediment-hosted gold mineralization. The inspiration for the project came from presentations and articles by Howard Poulsen of the Geological Survey of Canada (1996a, 1996b). 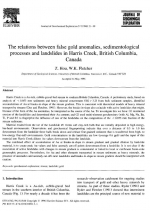 He pointed out that there is potential to find hypogene, sediment-hosted gold mineralization in Canada akin to deposits found in Nevada. He mentioned that if an intrusive association is important to generate the mineralization, then two different geological environments might host this style of mineralization. Accreted terranes with a basement containing carbonate lithologies intruded by Mesozoic or Cenozic plutonism would be a prospective geological setting, specifically the Stikine and Quesnel terranes. 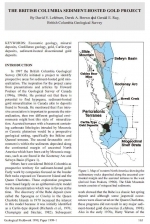 The second favourable environment is within the sediments deposited along the continental margin of ancestral North America which have been cut by Mesozoic magmas, such as are found in the Kootenay Arc and Selwyn Basin (Figure 1). 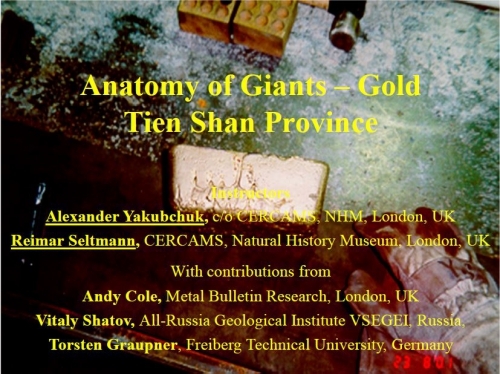 Автор(ы): Bourne B.T., Brommecker R., Dobak P.J., McEwan C.J., Robert F., Rowe R.R., Zhou X.
Издание: Ore deposit and exploration technology, 2007 г., 21 стр. Gold occurs as primary commodity in a wide range of gold deposit types and settings. In the last decade, significant progress has been made in the classification, definition and understanding of the main gold deposit types. Three main clans of deposits are now broadly defined, each including a range of specific deposit types with common characteristics and tectonic settings. The orogenic clan has been introduced to include vein-type deposits formed during crustal shortening of their host greenstone, BIF or clastic sedimentary rock sequences. Deposits of the new reduced intrusion-related clan share an Au-Bi-Te-As metal signature and an association with moderately reduced equigranular post-orogenic granitic intrusions. 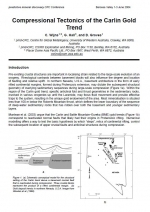 Oxidized intrusion-related deposits, including porphyry, skarn, and high-sulfidation epithermal deposits, are associated with high-level, oxidized porphyry stocks in magmatic arcs. Other important deposit types include Carlin, low-sulfidation epithermal, Au-rich VMS and Witwatersrand deposits. The key geology features of the ore-forming environments and the key geologic manifestations of the different deposit types form the footprints of ore systems that are targeted in exploration programs. Important progress has been made in our ability to integrate, process, and visualize increasingly complex datasets in 2D GIS and 3D platforms. For gold exploration, important geophysical advances include airborne gravity, routine 3D inversions of potential field data, and 3D modeling of electrical data. Improved satellite-, airborne- and field-based infrared spectroscopy has significantly improved alteration mapping around gold systems, extending the dimensions of the footprints and enhancing vectoring capabilities. 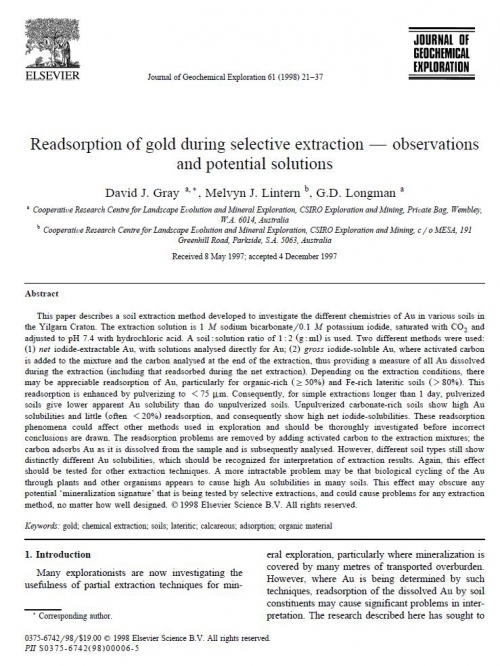 Conventional geochemistry remains very important to gold exploration, while promising new techniques are being tested. Selection of the appropriate exploration methods must be dictated by the characteristics of the targeted model, its geologic setting, and the surficial environment. Both greenfield and brownfield exploration contributed to the discovery of major gold deposits (>2.5 moz Au) in the last decade but the discovery rates have declined significantly. Geologists are now better equipped than ever to face this difficult challenge, but geological understanding and quality field work were important discovery factors and must remain the key underpinnings of exploration programs. Издание: University of Nevada, Reno, 2003 г., 27 стр. Издание: 2002 г., 11 стр. 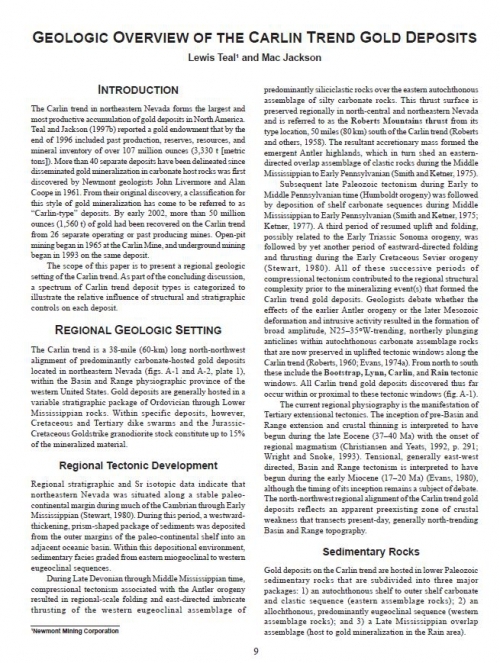 The Carlin trend in northeastern Nevada forms the largest and most productive accumulation of gold deposits in North America. Teal and Jackson (1997b) reported a gold endowment that by the end of 1996 included past production, reserves, resources, and mineral inventory of over 107 million ounces (3,330 t [metric tons]). 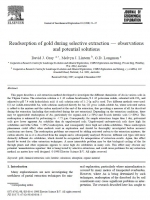 More than 40 separate deposits have been delineated since disseminated gold mineralization in carbonate host rocks was first discovered by Newmont geologists John Livermore and Alan Coope in 1961. 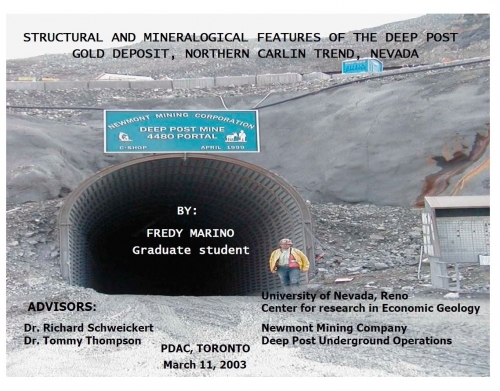 From their original discovery, a classification for this style of gold mineralization has come to be referred to as “Carlin-type” deposits. By early 2002, more than 50 million ounces (1,560 t) of gold had been recovered on the Carlin trend from 26 separate operating or past producing mines. Open-pit mining began in 1965 at the Carlin Mine, and underground mining began in 1993 on the same deposit. 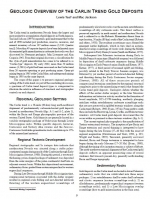 The scope of this paper is to present a regional geologic setting of the Carlin trend. 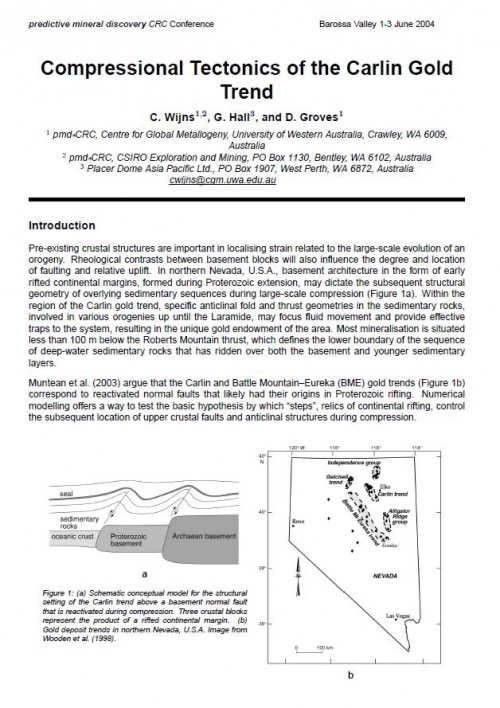 As part of the concluding discussion, a spectrum of Carlin trend deposit types is categorized to illustrate the relative influence of structural and stratigraphic controls on each deposit.